HydraCrypt Ransomware is a serious infection that has been created for one purpose – to obtain money from users. Cyber criminals know that it is not an easy task to extort money, so they encrypt all the users’ files and then ask them to pay a ransom. HydraCrypt Ransomware is not a unique threat. Research has shown that it acts in a similar manner as 7ev3n Ransomware, NanoLocker Ransomware, and JS.Crypto Ransomware. Like all these previously released threats, HydraCrypt Ransomware cannot be removed via Control Panel. Of course, you still have to do that, especially if you are not going to give your money to cyber criminals and decided to restore files from some kind of backup, e.g. USB flash drive and/or external hard drive (HDD). Researchers at pcthreat.com have thoroughly tested this ransomware infection and found that it immediately makes a copy of itself in one of these directories after it manages to enter the system: %APPDATA%, %LOCALAPPDATA% or %TEMP%. We are sure that there is one main reason why it acts like that. It is most likely that HydraCrypt Ransomware does that in order to ensure that it cannot be easily removed by the user. In addition, it tries to hide its presence for some time because it needs 10-20 minutes to finish encrypting all the files that exist on the system. Specialists say that HydraCrypt Ransomware will also add two Values, one of which might be ChromeSettingsStart3264 (with the C:\Users\user\AppData\Roaming\ChromeSetings3264\rovaxowy.exe Value Data). They can be found in HKEY_CURRENT_USER\SOFTWARE\Microsoft\Windows\CurrentVersion\Run. There is no doubt that it creates these values in the RUN registry key in order not to disappear after the computer restart and be able to start together with Windows. You will also find two emails on this message: XHELPER@DR.COM and AHELPER@DR.COM. It is said that you have to contact cyber criminals by any of these given emails in order to receive further instructions. You will be given only 72 hours to do that. If it happens that you do not contact the owners of this threat within the given time, it will destroy all your files and even sell them in a black market (at least, it says so). If you contact cyber criminals, we are sure that they will tell you the exact sum you have to transfer to them. It is very likely that they will need money in Bitcoins. You are the one who can decide whether to transfer money or not; however, we suggest that you restore your files from a backup if you have such an opportunity because nobody knows whether you will gain access to your files after making a payment. 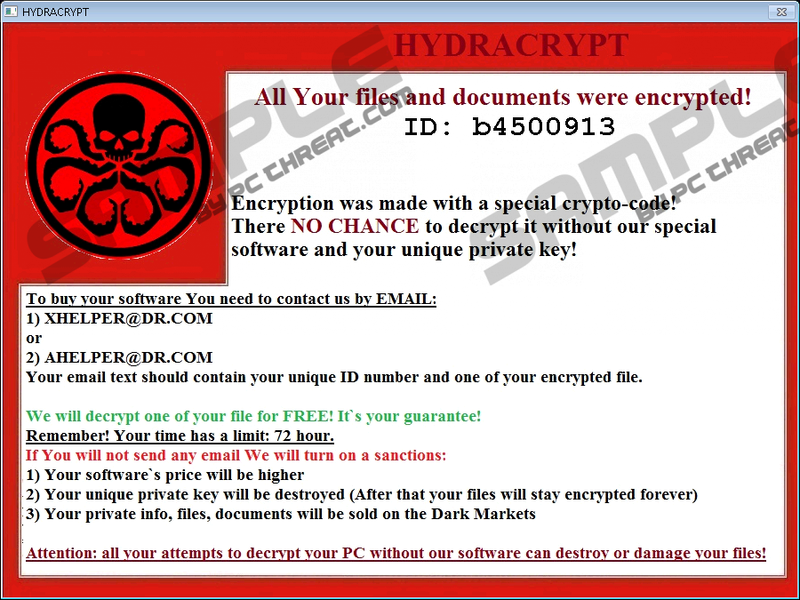 It has been observed that users might download the main file of HydraCrypt Ransomware after they open a spam email, click on an untrustworthy link, or if they tend to download software from unreliable third-party web pages. On top of that, this threat might sneak onto computers with the help of other malicious software installed on the system. Therefore, it would be clever to make sure that the system is clean all the time. It seems that nothing bad will happen if users do not double-click on the main file of HydraCrypt Ransomware even if they download it on their PCs. Unfortunately, the majority of them do that and thus allow this threat to enter their systems. If you feel that you cannot protect your system from harm, you have to install a security tool on your PC. We are sure that it will prevent malware from entering your system in the future. Even though HydraCrypt Ransomware does not block .exe files and system utilities like other ransomware infections that exist on the web, it is still not so easy to remove this threat. Therefore, we have prepared the manual removal instructions and placed them below this article. In case these instructions do not help you at all, you should download, install, and then scan your system with an automatic malware remover, such as SpyHunter. Remember, your files will stay encrypted even though you get rid of HydraCrypt Ransomware; however, you still have to do that ASAP. Select Control Panel and open Appearance and Themes. Under Hidden files and folders, mark Show hidden files and folders. Mark Show hidden files, folders, and drives under Hidden files and folders. Click on the View tab at the top. Mark Show hidden files, folders, and drives. Launch RUN (Windows key+ R). Locate the ChromeSetingsStart3264 (might have a different name) Value. Right-click on it and Delete it. Go to %APPDATA%, %LOCALAPPDATA%, and %TEMP% (copy and paste the directory in the address box and tap Enter) and find the file with a random string of letters. Right-click on the file and select Delete. Remove two images that have the symbol of HydraCrypt ransomware and all the files that belong to this threat from your Desktop. We suggest that you scan your system with an automatic malware remover too in order to check whether or not this ransomware infection is fully removed. Quick & tested solution for HydraCrypt Ransomware removal.